On the show today we welcome none other than Azeem Azhar, early stage investor and founder of the Exponential View newsletter and podcast. Azeem is here to talk to us about his own work in covering the latest and most innovative developments in technology as well as comment on the current startup and tech landscape, the European market, and offer some exciting future predictions for our listeners! We discuss his audience and the mutually generous relationship he shares with them, some of Azeem’s concerns for the near future, nano satellites and of course, the cloud. Azeem offers first hand insights into the differences between the startup scenes in the US, Europe, and China and the reasons for these disparities. He also comments on the increasing speed of the innovation cycle and moving past Moore’s Law into new territory. For this great conversation, be sure to join us today! On the show today we welcome Andreas M. Antonopoulos (@aantonop) to chat with us about his perspectives on the current crypto space, the contrasting developments of Bitcoin and Ethereum, and the massive role that design choices play in the future of these two currencies. We also welcome cryptocurrency analyst Arjun Balaji (@arjunblj) as a co-host for this episode. Together we field some introductory and more complex questions on ways in which Bitcoin and Ethereum compete, could potentially replace each other, and areas in which their goals might overlap. We talk about ideological choices from consumers, some of the pitfalls of Ethereum and why he has very little interest in which is the better investment. Andreas also explains scaling solutions and privacy concerns. For all of that and more, tune in today! Comparing the paths and goals of Bitcoin and Ethereum. Considering the idea of one of the currencies replacing the other. The privacy concerns and how they play into each culture. Ideological alignment choices by consumers. Andreas’ motivation for writing a book about Ethereum. Potential pitfalls of Ethereum and Andreas’ biggest reservations. Scaling solutions with regards to Ethereum. Reconfiguring our perceptions of cryptocurrencies as tools for particular jobs. In this episode of FYI, we chat with Siraj Raval, Director of the School of AI, data scientist, entrepreneur, and much more. Siraj is a leading YouTube educator on the topic of AI and has helped half a million subscribers stay abreast of AI and the latest developments in the field. Today we discuss what prompted his focus on AI in general and deep learning in particular. Siraj also explains some of the recent news stories that have excited him and what he thinks we should pay more attention to. He talks about DeepMind’s AlphaFold, Open AI, self-driving cars and AI text generation. For all this and more, join us on today’s episode! The turning point when Siraj decided to focus on YouTube teaching. Siraj’s unconventional and data driven approach to content creation. Why Siraj thinks people should pay more attention to Deep Mind’s AlphaFold and China. Comparing AlphaFold to previous algorithms for protein folding. Understanding Open AI’s text generator. Can we have intelligent AI without solving consciousness? Scaling existing systems versus breakthroughs and leaps. How Siraj has applied himself to public education instead of high profile company work. A little bit more about School of AI. Reasons for Siraj’s interest and belief in China. In this episode we are joined by special guest Eric Berger, the senior space editor for Ars Technica, as well as our very own automation, energy, and space analyst at ARK Invest, Sam Korus. Together we deep dive into the space industry, particularly the rocket industry, and discuss a new area of space exploration. We discuss how more affordable access to space will likely be a game changer and how it could open up a whole range of new business opportunities. For instance, why do companies and startups pursue global internet or commercial space travel? For an incredible conversation, be sure to tune in! Hear more about Eric Berger and how he got into researching the space industry. The evolution of the ecosystem to support the small rocket industry. Understanding the foundational movement in aerospace called new space. The reasons why companies are going after global internet. The premise behind the Space X business plan – offering relaunch ability and reusability. NASA’s research program on supersonic air travel. Why smaller companies are willing to innovate while established players are playing it safe. Today we are thrilled to be in Fremont, CA with Tesla CEO Elon Musk. In this episode Tasha Keeney, Analyst at ARK Invest and Cathie Wood, Founder, CEO, and CIO at ARK Invest chat with Elon about the future of Tesla and autonomous driving. The podcast conversation kicks off by sizing the upcoming boom in global electric vehicle demand which leads into a discussion around linear versus exponential growth. Elon explains Tesla’s competitive edge against autonomous driving peers like Waymo and talks about a key upcoming milestone for Tesla, which he thinks most people are overlooking. Elon shares his insights about Tesla’s autonomous strategy, and the timeline of how the process is laid out. We also discuss the autonomous driving regulatory environment and the crucial role that machine learning plays in getting full autonomy on the roads. For an incredibly insightful conversation do not miss out on this podcast episode. Why Elon believes Tesla has the best people to solve this problem. Importance of consumer use of autopilot to further the process. Tesla’s approach to letting other automakers use their technology. Curveball Question: What does Elon think about Bitcoin? We are joined by our very own automation, energy, and space analyst, Sam Korus. Our topic of conversation is automation in the food industry and how robotics “in front and back of house” might change the industry. A simple reaction to more automated jobs is that it decreases the demand for human roles. However, Sam explains how further automation can actually stimulate human employment through price drops and demand increases. We chat about what sorts of roles can be fulfilled by robots currently and the types of services that are already in place in certain locations. Sam quickly explains how the predicted job increase could work and shares with us his research findings for automation in the food industry. Sam will talk about collaborative robots, use cases coming out of China, and more. Why more automation and robots could actually increase job numbers. Obvious options for automation in the food industry. An overview of the predicted results of higher automation. The statistical growth we could see in the US food industry. Collaborative robots and “back of house” use cases. In this episode we are joined by our very own crypto-analyst, Yassine Elmandjra, to talk about the idea that Bitcoin is becoming increasing centralized. This narrative has been growing over the last while with bigger entities supposedly controlling larger portions of the blockchain. Yassine shares his perspectives, ultimately showing that this argument has some serious flaws and that the blockchain has attributes that can prevent so-called “market control”. In our discussion, we cover the basics on the blockchain, mining, and the threat of a “51% attack” before going on to talk about pool centralization and its non-desirability. All of this is explained with the history of Bitcoin in mind. We are looking at the developments in blockchain technology from the last few years. For all this and much more, be sure to tune in! Why does it matter if Bitcoin is becoming more centralized? Understanding mining and the basics of the blockchain. 51% attacks, Bitmain and mining equipment. Looking at the evolution of Bitcoin mining since 2009. Assessing the threat of mining pool centralization. Reasons why it is not really desirable or feasible to gain 51% of any mining pool. The changes in concentration in the Bitcoin blockchain. The improvement in mining pool concentration over the years. Lowering electricity costs through stranded energy assets. Placeholder’s underlying and primary thesis. Weighing Bitcoin’s store of value versus it being a medium of exchange. How to measure Bitcoin’s future success as a currency. The long-term arc of Bitcoin’s volatility. Regulation and “do no harm” sentiments in the crypto space. The U.S. government’s role and involvement in the crypto space. Looking at international attitudes towards crypto. Amazon AWS – The Everything Store for Enterprise Computing? Welcome back to a new episode of FYI, For Your Innovation Podcast, a podcast exclusively focused on disruptive innovation. Today on the show Yassine Elmandjra will be co-hosting the podcast with James Wang. We will be diving into the recent announcements at the AWS re:Invent Conference and what it means for the cloud computing space as a whole. Just how Amazon is the everything store for consumers, it seems like Amazon Web Services (AWS) is really the everything store for business and enterprise computing. Inside this episode we explore how Amazon has been able to take over an increasing amount of verticals, their shift into the enterprise software space, and how they are strategically eliminating the competitive edge of other companies with each new product release. We also dig into the importance of owning the customer relationship and why that has given Amazon a much greater insight into the consumer market on all fronts. For an incredible conversation on Amazon’s disruptive innovation, stay tuned in to today’s episode! 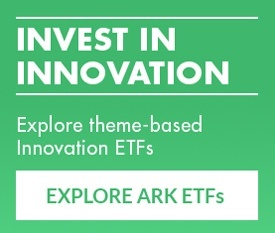 https://ark-invest.com/wp-content/uploads/2018/12/aws-fyi-ep03.jpg 1400 1400 James Wang, ARK Analyst https://ark-invest.com/wp-content/uploads/2016/05/ARK-Invest-Logo.png James Wang, ARK Analyst2018-12-10 08:49:292018-12-10 08:49:29Amazon AWS - The Everything Store for Enterprise Computing? In this episode of the For Your Innovation Podcast, we chat with Horace Dediu of Asymco about his ideas on micromobility. With the unpredictable and burgeoning market that Horace is immersed in and fascinated by, there is so much to unpack and discuss in terms of possibilities and implications. This discussion offers a large array of thoughts and considerations for anyone connected to the future of transportation. It seems clear that micromobility will be a force to be reckoned with in the world of transit as well as in the global economy. Horace expertly explains many of his thoughts and goes into detail regarding possible permutations across the subject. We talk business models and industry comparisons, as well as looking at the key areas in which micromobility battles will be fought. For a detailed and horizon expanding conversation, be sure to tune in! A definition of micromobility and how Horace started using the term. Some of the factors that have led to the growing adoption of these modes of transport. Who might win and lose as micromobility develops. Range anxiety and how distance plays into the question. Trip and distance data and what these can and cannot teach us. The important competitive dynamics and business models right now. The conditions that are necessary for more widespread adoption in the US. Evolving infrastructure around charging of electric vehicles. The role and place of manufacturing in the micromobility space. An overview of Horace’s current theses on micromobility. Welcome to FYI, the For Your Innovation Podcast. This show offers an intellectual discussion on technologically enabled disruption, because we believe that investing in innovation starts with understanding it. Today on the show we welcome on Tasha Keeney, Analyst at ARK Investment, who covers autonomous transport and 3D printing. ARK is a leading investment manager focused on disruptive innovation that is changing the way the world works. ARK was formed to capitalize on the opportunities created by companies benefiting from technological change. Inside this episode, Tasha joins us to talk about the state of the autonomous vehicle landscape and the Mobility-as-a-Services thesis. We also dive into the different launching strategies for various autonomous car companies, predictions for the future of autonomous cars, and learning how to understand the potential opportunity for investors going forward. For all this and more, stay tuned for this incredible conversation. Tasha’s view on what the autonomous car landscape looks like right now. The differences between level four and level five autonomous cars. Timelines for commercialization of Waymo and GM autonomous cars. Discussing launch locations and strategies for Waymo and GM autonomous cars. Tesla’s strategy for rolling out autonomous vehicles, and how it differs from Waymo and GM. Understanding why LIDAR can be seen as a crutch for autonomous vehicles. Mechanical, or spinning, versus solid state LiDAR. The best way for investors to look at the opportunity of autonomous vehicles.